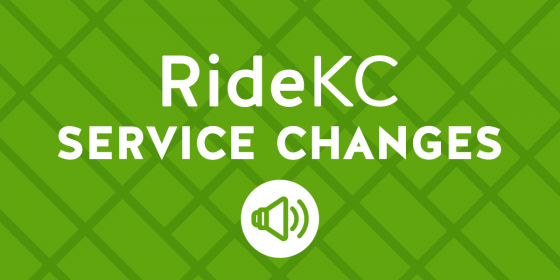 (Kansas City, MO – Sept. 27, 2017) Many RideKC routes will change next week, including both MAX bus rapid transit lines. The changes will improve the overall efficiency of transit service, and provide service that better matches local transit needs. Main MAX will run on Grand from the River Market to Crown Center. This change will allow for quicker travel through downtown, allowing riders to arrive at their destination sooner. MAX will no longer run its circuitous route on Wyandotte, Main, Oak, 8th, 9th, 11th, and 12th streets. South of Crown Center, the MAX route will continue to serve midtown, Country Club Plaza, Brookside and Waldo. A new transit center will anchor bus service in south Kansas City. 3-Trails Transit Center, at Bannister and Blue Ridge, will serve as a hub for six RideKC routes: Troost MAX, 28 Blue Ridge, 29 Blue Ridge Limited (previously 28X Blue Ridge Express), 75 75th Street, 99 South KC Flex, and 399 Raytown Flex. Routes and times will change for these lines. 75 will no longer travel west of Ward Parkway Shopping Center to Overland Park during the rush hour. This service will be offered by 51 Ward Parkway during the rush hour. Another set of changes will improve access to jobs and shopping in south Kansas City. 57 Wornall will travel further south, providing regularly scheduled transit service seven days a week to an area that previously had limited Flex service that required a call ahead of time. 57 will no longer travel between the Plaza and Waldo; however, Main MAX will continue to make connections between these two areas. Flex routes 99 and 98 will combine service as 99 South KC Flex. 99 will serve Metropolitan Community College-Longview, Loma Vista Shopping Center, and Red Bridge Shopping Center. 570 Blue Springs Express is changing its route and reducing the number of trips from four to three. This change is due to a reduction in funding. Several other routes will change names, consistent with RideKC’s naming plan. The new numbering system will be organized into regions and types of service. For example, Kansas City, Missouri, routes south of the Missouri River use numbers 1-99, and routes north of the river use 200-299. 51X Ward Parkway Express will be renamed 52 Ward Parkway Limited. 108 Indiana will be renamed 18 Indiana. 121 Cleveland-Antioch will be renamed 21 Cleveland-Antioch. 129 Boardwalk-KCI will be renamed 229 Boardwalk-KCI. 133 Vivion-Antioch will be renamed 233 Vivion-Antioch. 136 Boardwalk-Antioch will be renamed 234 Boardwalk-Antioch. 243 Riverside-Antioch will be renamed 231 Riverside-Antioch. 251 TMC-Lakewood will be renamed 340 TMC-Lakewood. New schedules are available at RideKC.org and on board buses. For help planning a trip on an affected route, call the Regional Call Center weekdays between 6 a.m. and 7 p.m. at 816.221.0660.